The "run the ball and stop the run to win in the playoffs" bandwagon has veered off course yet again. The 2009 NFL season has delivered two pass-happy teams to South Florida, with the Indianapolis Colts and New Orleans Saints expected to produce a shootout. In a season where the mainstream media proclaimed the NFL to officially be a passing league, it seems only logical that we'd end up with two teams built around the pass. While the Saints lead the league in rushing DVOA, they're a pass-first offense that uses the run to throw teams off the aerial attack's scent. The arrival of defensive coordinator Gregg Williams and the emergence of Jabari Greer as a shutdown corner finally gave them a pass defense to capitalize on the mistakes teams made when they were trying to keep up with Drew Brees and company. That's the same game the Colts have played with Peyton Manning under center and Dwight Freeney on the defensive line, but that's beginning to change under new head coach Jim Caldwell. While the Colts of the aughts were famed for sacrificing run defense to try and shut down opposing passing games, it's the Saints who were 29th in the league against the run this year. The Colts blitzed more than they ever did under Tony Dungy, and while a 0.0% defensive DVOA against the run isn't anything to write home about, it's impressive considering Bob Sanders made all of three tackles during the 2009 season. With two evenly matched teams employing similar styles, this game will either come down to one of two things: a huge dose of luck, or the intricacies of matchups and situations. Can the Colts' zones handle the Saints death-by-a-thousand-formations offense? Can the Saints stop the run if the Colts get ahead early? We'll break that and much more down in this, our Super Bowl XLIV preview. In the charts we've included on this page, games where teams sat their starters are colored differently and are not included in the trendlines. In addition, we've calculated weighted DVOA without those "sit starters" games for those respective teams, and have included those numbers in this article. 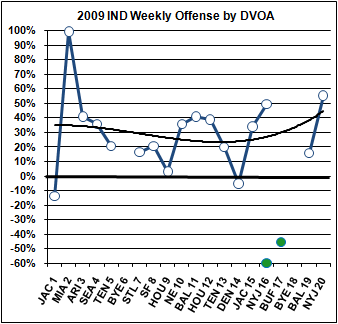 Note that the Indianapolis charts include a pair of dots for Week 16; the dot that's marked a different color and not included in the trendline is that unit's DVOA after Peyton Manning departed the game in the third quarter. The Saints' passing offense is built around creating mismatches at the line of scrimmage and exploiting them with quick, high-percentage throws. They have a group of skill-position players that don't fit preconceived notions about fitting player A into position B. While they have your standard deep threat in Devery Henderson and all-around tight end in Jeremy Shockey, they take "tweener" skill sets and make success stories out of them. Wide receiver Marques Colston moves around the field and ends up in the slot or even at tight end, abusing linebackers and safeties with his huge frame. Mostly freed of the constraints of being a traditional halfback, Reggie Bush torments nickel corners and woefully overmatched linebackers in the flats. Tight end David Thomas spends most of his time lining up at fullback. All of them are great after the catch. The ideal matchup for the Saints is a team that big-blitzes a fair amount and plays lots of man coverage, someone like the Eagles or the Redskins; Brees finds the bad matchup at the snap or stays upright long enough to find the open receiver, they break a few tackles, big plays abound. Although they're unquestionably moving away from the Tampa-2 scheme Tony Dungy favored, the Colts are still a conservative team defensively and play a lot of zone coverage. A look at our game charting stats shows the tell-tale signs of zone coverage, as the Colts cornerbacks rank much higher in yards per play than in Success Rate, and they allowed fewer yards per carry than any team in the league. The Saints peddle in speed up and down the offensive roster, but the Colts can counter that with the league's fastest defense. While Colston against a linebacker is almost always a mismatch, Clint Session might prove to be the reason why the qualifier "almost" exists. The Colts have the team speed to run down Bush in the alleys and maybe even get pressure on Brees with a four-man rush. They might be better off blitzing, though, and one of the reasons we suggest that has to do with the team on the Colts' 2009 schedule that had the most similar offense to the Saints: the New England Patriots. Before fourth-and-2, Indy had mostly been sliced apart by Tom Brady while rushing their front four and dropping into intermediate zones across the field, with one and often two safeties deep in a Cover-1 or Cover-2 alignment. Tom Brady exploited these looks in a variety of ways, and it provides a blueprint for how the Saints are likely to attack the Colts. The Colts alternated between a 4-3 and a 4-2-5 alignment, with cornerback Jerraud Powers lining up across from Wes Welker in the slot, but dropping into a shallow zone on most plays. While the Colts are already undersized in their standard alignment, the presence of the nickelback gave the Patriots even more of an impetus to run the ball, which they did effectively. While Session's unquestionably a talented player, he gets lost at times in the running game and either gets caught in trash or misses on lunging tackles. Don't be surprised if Brees audibles into run plays against the nickel early on in the contest. Of course, the running game sets up play action, and that's where the Colts were really hit hard. The Patriots had five plays of 15 yards or more, and four of them came off of play action. Game charting stats show the Colts allowing 7.5 yards per pass against play-action fakes, but just 5.6 average yards on other pass plays. (This gap ranked tenth in the NFL.) With the Colts content to play soft zone coverage, play action forced their linebackers to rush towards the line, which created gaping holes in between the two deep safeties and the intermediate zones. That's the perfect opportunity for Colston to get open running down the seam. The Patriots also used the threat of play action to isolate Randy Moss against defenders one-on-one, with differing levels of success. A long touchdown pass to Moss came when he was released by a cornerback into the zone of safety Antoine Bethea, who was concerned about the play action in the backfield; by the time Bethea realized it was a play-fake, he was backpedalling and trying to catch up with Moss, who ran right by him for the score. Bethea made up for it with an interception on a very strange play; Moss got open on a deep post against a cornerback that appeared to be Tim Jennings (hard to tell from even the HD feed on TV), but as he got his step, the two deep safeties were actually swapping sides in mid-play and running to opposite sides of the field. Bethea ran from a deep zone on the right side of the offense all the way to the left hashmark, where he undercut Brady's slightly underthrown pass for an interception. Plays like that aren't how the Colts turned things around, though; their success came with pressure. They clearly changed their scheme around after Moss caught his second touchdown pass of the day, early in the fourth quarter. Up to that point, Tom Brady had dropped back 32 times, and the Colts had blitzed five defenders or more five times. They weren't even threatening to blitz on most plays; they gave Brady easy pre-snap reads, and he took advantage. After that touchdown, things changed. Brady dropped back 12 more times, and the Colts rushed five or more seven times. The Patriots picked up two first downs on those 12 plays after nabbing 15 first downs or touchdowns on the preceding 32. It was a small sample, but the Colts clearly changed their style and it helped things. If you want a larger sample, a season's worth of game charting says that the Colts allowed 5.0 yards per pass with five pass rushers, compared to 5.9 yards per pass with the standard four and 5.5 yards per pass on the rare occasion they sent a big blitz of six or more. If they don't switch up the pass rush against Drew Brees, he will pick them apart at the line and manipulate them with his eyes after the snap. The likelihood of a limited Dwight Freeney only makes that more of a fact. The Saints will respond to the Colts' Cover-2 with formations designed to beat zone coverage. Expect to see them line up twin wide receivers on one side of the ball on most snaps; if they want a fullback, they'll play David Thomas there and use him as their safety valve while Colston lines up in the slot, and if they're going with three wide receivers, Colston will play in what essentially amounts to the role of a tight end while Robert Meachem and another receiver -- a wideout, Bush, Shockey, even perhaps one of the Thomases -- operate on the other side. When the Colts start figuring that out, the Saints will move to their Offset-I with David Thomas as the fullback split directly behind Shockey as the tight end, and Colston lined up tight next to Shockey, giving them a look similar to the Trips Bunch sets that the Steelers used with great success in last year's Super Bowl. The Saints are set up well to follow the Patriots' strategy of running the ball against the Colts' speedy and undersized defenders, and then taking shots deep if the Colts move a safety up to combat the run. Although the Saints offense is based around the pass, they run a lot more than most people realize. Only four teams had more running back carries during the regular season, and the Saints led the league in rushing DVOA. Although the Colts did a reasonable job of preventing long open-field runs, the Saints should be able to get steady gains on them, especially when they run up the middle or to the right side. The Saints also ran play-action more than any other offense in the league this year. They were one of the few teams that averaged more yards per pass without play action (8.2) than with (7.6), but 7.6 yards per pass is nothing to sneeze at. And no team in the NFL this year went deep better than the Saints did. Across the NFL, deep passes (more than 15 yards in length) gained an average of 11.8 yards. They were caught 40 percent of the time, and the league-wide DVOA on these passes was 22.5%. When the Saints threw deep, they gained an average of 17.0 yards with 77.4% DVOA and a 55 percent catch rate. The first two numbers were the best in the league, while the last was second to Houston -- but the Saints and Texans were the only two offenses to complete over 50 percent of deep passes. The Saints have faced stronger pass rushes since midseason, which means they haven't gone deep quite as often, but they're still very successful when they do it. And as Braylon Edwards showed two weeks ago, the Colts cornerbacks can get beaten deep if you have the speed to get behind them and they've switched their coverage out of the usual Cover-2. The best time to run the play-action deep pass is probably in a second-and-short situation where a run is likely, as the Colts had the league's worst defensive DVOA on second down. However, if they want to have success running against the Colts, the Saints may want to get out of their usual patterns of which formations lead to runs and which lead to passes. It's surprising for a defense known for speed and not strength, but Colts opponents averaged 4.7 yards per carry when they spread things out with only one running back, and only 3.6 yards per carry with two backs in the backfield. That's an important split because during the regular season, 74 percent of the Saints' carries came with two players in the backfield, the second-highest percentage in the league behind Miami. The Colts defensive line also shows strength when strength against the run is most important: short yardage. The Saints converted 67 percent of runs in power situations (seventh in the NFL) but the Colts only allowed opponents to convert 56 percent of the time (sixth in the NFL). In many ways, the Saints defense is a second-class version of the Jets defense that Indianapolis had to beat to get to the Super Bowl. Both teams feature one cornerback who is significantly better than his teammates, with Jabari Greer set to play the role of Darrelle Revis. Both teams like to blitz -- the Saints sent more than four pass rushers on 46 percent of passes, making them the only defense that blitzed more often than the Jets during the regular season. The big difference between the two defenses comes against the run, where the Jets stayed strong despite the midseason loss of nose tackle Kris Jenkins... and the Saints are very, very weak. The similarity between Revis and Greer suggests another big game for the Colts' second receiver, Pierre Garcon -- but upon further inspection, this may not be the case. Most teams leave their starting cornerbacks on specific sides of the field rather than moving them around so the better corner is covering the other team's top receiver, and the Saints are no different. Jabari Greer is generally playing on the left side, which is the offensive right. Offenses generally move receivers from side to side more than defenses move cornerbacks, but this is yet another way in which the Colts rarely vary their offensive game plan. 77 percent of passes to Wayne this season found him on the left side of the field. 86 percent of passes to Garcon found him on the right side. Unless somebody moves around on purpose, the Saints are going to end up with Greer on Garcon for most of the game. We're likely going to see coverage similar to the NFC Divisional Round game against Arizona, when Greer was often one-on-one against Steve Breaston while Tracy Porter and a safety (usually Roman Harper) doubled Larry Fitzgerald on the other side. The biggest problem for the Saints will almost definitely be what happens in the slot. Against third and fourth wide receivers, most of whom normally line up in the slot, the Saints were 20th in DVOA. The game charting stats concur, as nickelbacks Randall Gay and Malcolm Jenkins came out much worse than Greer and Porter. Our "defense vs. types of receivers" stats show that once you adjust for the tendencies of each offense, Saints opponents threw to "other wide receivers" more often than against any other defense, and the Saints ranked third in yardage allowed per game to these receivers. Of course, Dallas Clark isn't just a good tight end; he's a good tight end who often isn't a tight end. As longtime FO readers know, Clark is a tight end because of his jersey number and his fantasy football classification; he spends more time flexed out in the slot than any other tight end in the league. Clark won't draw Vilma on most plays on Sunday; he'll draw Randall Gay, the Saints' nickelback, or outside linebackers Scott Shanle and Scott Fujita. He's a mismatch for any of them, especially Gay, on whom he has four inches and about 50 pounds. When Clark does line up as a tight end, the Colts can opt to move Garcon into the slot or bring in Austin Collie, who is a better matchup for Gay, but not by much. The Saints could double-team the slot receiver with bracket coverage from Gay on the outside and either Shanle or Fujita on the inside, but you can't double-team everyone. The pre-snap game between Manning and Vilma, who is entrusted with modifying coverages pre-snap by defensive coordinator Gregg Williams, is going to be fascinating to watch. On Vilma's side, he's going to have to do his best to convince Manning that the coverage he's seeing is right, only for it to change after the snap; in the meantime, when he sees Manning change the play at the line and his brain screams that the Saints need to quickly sprint into a new coverage scheme, he has to do it subtly enough that he doesn't reveal this new hand to Manning. The Saints will blitz most on third downs, but that's also when they have the hardest time getting to the quarterback. The Saints send a big blitz on 15 percent of first downs, 22 percent of second downs, and 29 percent of third downs. Yet they rank eighth in Adjusted Sack Rate on first and second down, but 29th on third and fourth down. The Colts have the lowest Adjusted Sack Rate in the league, but that ASR gets even better on third down: a miniscule 1.4 percent. Peyton Manning only took three sacks on third down all year. We know the Colts will have success throwing the ball, but they're bound to have even more success if the Saints defense isn't expecting pass on every play. Indianapolis doesn't run the ball very much, ranking 27th in running back carries. (14 straight wins didn't even lead to a lot of carries running out the clock, since so many of those wins were late-game comebacks.) Do the Colts try to battle the Saints' weakness with their slightly-less-weak weakness? It's probably a good idea, particularly since the Colts' best direction in Adjusted Line Yards is up the middle, where they rank eighth. That matches the weakness of the Saints' run defense, whose two defensive tackles -- Sedrick Ellis and Anthony Hargrove -- are much better pass rushers than they are run defenders. Apologies for repeating these numbers from past playoff previews, but... Sedrick Ellis had a 53 percent Stop Rate on runs, the worst of any NFL defensive tackle with at least 20 run tackles, and he made his average tackle after a gain of 3.5 yards, the second-worst figure among defensive tackles. Anthony Hargrove wasn't much better at 62 percent and 3.2 yards. Remi Ayodele actually had the best numbers of the three main Saints tackles (65 percent, 2.5 yards). Expect to see a lot more Joseph Addai than Donald Brown in this game, considering that Addai has a better DVOA rating (7.7% vs. -12.4%), a better Success Rate (53 percent vs. 46 percent), and, goddammit, a much better grasp of blitz pickup responsibilities. Perhaps the most important place for the Colts to get away from their pass-first mentality is the red zone. The Saints defense improves dramatically in the red zone, but that's primarily because of excellent pass defense -- so good that the Saints are first overall in red zone defensive DVOA despite ranking 21st against the run in the red zone. Despite their poor running attack, the Colts still use a lot of play action. Charters recorded the Colts using a play fake on 23 percent of plays, fifth in the league and not too far behind New Orleans. However, unlike the Colts, the Saints had an excellent defense against play fakes, one of only seven teams that actually allowed fewer yards per pass when the opponent ran play-action before the pass. Indianapolis has struggled on special teams for years, and "Mr. Clutch" Adam Vinatieri has been injured at midseason. Meanwhile, special teams performance was a huge part of the Saints' win in the NFC title game, and Reggie Bush is a threat to score every time you punt to him. So, this is the one place where the Saints have a clear advantage over the Colts, right? Actually, no. The Colts (20th) actually ranked higher than the Saints (28th) in the Football Outsiders special teams ratings during the regular season. The Saints' poor value on field goals was all compiled by John Carney, and replacement Garrett Hartley has been average -- but considering that just makes the two teams even. The Saints' special teams have been great the last two weeks -- but really only the last two weeks. The Saints have only had three games this year where the special teams were worth at least five points of field position, and two of those three games have come in the postseason. There's no reason to expect that this level of performance is more "real" than what the Saints showed in the regular season. The difference between the two teams is not the overall quality of special teams, but rather the likelihood of a big play on special teams. The Colts got a 93-yard kickoff return touchdown from Chad Simpson against the Jaguars in Week 15, but that was their only kickoff return over 40 yards all season. The Saints, by comparison, had five kickoff returns over 40 yards in the regular season, plus another two against Minnesota two weeks ago. (The Saints also have more big plays on punt returns, although the gap is smaller: including the playoffs, the Saints have nine punt returns over 10 yards while the Colts have six.) To neutralize Saints kick returner Courtney Roby, the Colts will need a big game from the rookie with the big leg, punter/kickoff specialist Pat McAfee. Based on FO measures, McAfee was the best kickoff man in the league this season. Take out squibs and onside kicks, and McAfee leads the league with 70.8 yards per kickoff. The problem is that the Colts were just average in net kickoff value because their coverage team gave almost all that value back by allowing long returns. McAfee needs to keep the game out of the hands of his coverage team by kicking as many touchbacks as he can. Scott Green will be the referee for Super Bowl XLIV. Stats on Green from the last three seasons show two tendencies. First, his crew calls offensive holding much less often than average. This is less of an issue for the Super Bowl because the Super Bowl uses an "all-star" crew. The umpire will be the awesomely-named Undrey Wash, and he's called offensive holding at an average rate over the last couple seasons. However, the second tendency is that Green almost never calls roughing the passer. He's thrown only seven flags for roughing the passer over the past three seasons, including zero during the entire 2008 season. You may remember him missing a couple of possible roughing the passer situations in the Green Bay-Arizona wild card game, including that facemask on Aaron Rodgers during the fumble that ended the game. This could be bad news for the Colts given Gregg Williams' promise that the Saints defense will deliver "remember me shots" to Peyton Manning. Also of note: The three officials in the secondary, Rob Bernatchi, Greg Meyer, and Greg Steed, all worked for crews that were below average in calling defensive pass interference this season. The Saints (98 penalties, 24th) and Colts (87 penalties, 31st) were both among the least penalized teams in the league this season. We've covered seven Super Bowls since Football Outsiders launched in 2003, and out of those seven games, Super Bowl XLIV looks like the closest matchup before the fact. Why does conventional wisdom -- and the Las Vegas line of Colts by six -- underestimate the Saints? Perhaps it is because the last game each team played is strongest in our minds, and that was the worst offensive game for the Saints since October. Perhaps it is because we think the Colts' regular season losses "don't really count." That may be true, but while the Saints' losses to Dallas and Tampa Bay are more "real," so is the fact that their regular-season victories were generally bigger than those of the Colts. In our regular-season ratings, the Saints (23.4% DVOA) ranked higher than the Colts (17.1% DVOA). In our weighted ratings, including the postseason and discounting the Curtis Painter games, the Saints (26.7% DVOA) still rank slightly higher than the Colts (25.6% DVOA) -- but the gap is minimal. The Colts have a good chance to get out to a quick early lead, as the Saints ranked dead last in defensive DVOA in the first quarter, then eighth from the second quarter on. (Just ask the Arizona Cardinals about how easy it can be to score on the Saints early.) A big early lead that makes the Saints give up on the run is a problem, but a small early lead is easily made up, and the most likely scenario in this game is for it to stay close to the very end. Both the Colts and Saints ranked among the best teams in the league in late and close situations, on both sides of the ball. The Saints may be a little bit overdependent on big plays, whether they be deep bombs, kick returns, or the kind of turnovers that Peyton Manning rarely makes. On the other hand, the Colts may be a little bit overdependent on the health of Dwight Freeney's ankle. Put it all in the big blender of matchups, and the result still comes out 50-50. This should be, and hopefully will be, an exciting, high-scoring, and very close game. Each team also gets a chart showing their performance this year, game-by-game, according to total DVOA. In addition to a line showing each game, another line shows the team's trend for the season, using a third-power polynomial trendline. That's fancy talk for "the curve shifts direction once or twice." There are two charts for each team: one for offense, one for defense. 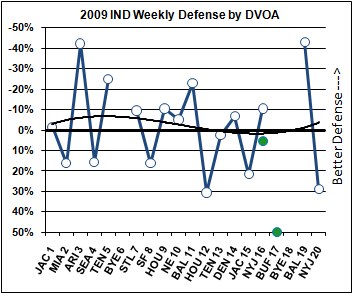 Because defensive DVOA is opposite of offensive DVOA, the defensive charts are flipped upside-down -- the higher dots still represent better games. In the tables with cornerback stats, there are 70 cornerbacks ranked with a minimum of 40 charted passes. Passes marked Hail Mary, Hit in Motion, Tipped at Line, and Thrown Away are removed, as are wide receiver screens (not really a good measure of coverage ability because the corner is immediately blocked out of the play). These numbers are not yet corrected for "half coverage" on zone coverage plays (which of course affects the Colts numbers). All stats except for WEIGHTED DVOA are regular season only, unless noted. ... Can any of this be true? ESPN has repeatedly assured me that the Holy Manning will decimate the Saints, who are adorable to try but have absolutely no chance. Peyton Manning is a machine. He does not show pity, or fear, or remorse, and he absolutely will not stop until you are dead. Do you get me? It's not rational, but this traumatised Texans fan can well understand the feeling that the Colts are too good to be blown out, and that if Manning gets the ball with 6 or fewer minutes remaining and a chance to take the lead, he's going to score and the Saints aren't going to get the ball back. It's not just the fact of the comebacks, it's the horrifying sense of inevitability that you experience while watching them. Hey, as a Texans fan, how do you feel about your team getting eliminated from the playoffs because the Colts decided to lay down? I thought that was the worst part of the whole affair at the time. As for Peyton Manning, he's a great QB, but I think the media hype machine is getting carried away. Joe Montana won four Super Bowls, Peyton Manning's got one. Numbers don't lie, and as usual FO's got the best numbers and they say it's going to be a close game. So can't we get one talking head to take the Saints over the Colts? As it stands you'd think the Colts were playing the Lions' second string. I've seen at least one, I think on NFLN. I was waiting to get my hair cut, and the volume was low, so I didn't catch all of it. I think the Colts are perceived as the better team because they've been a very, very consistently good team for at least the past three seasons. The only thing that really hurt their performance was Peyton's knee scope. Conversely, the Saints' defense came out of nowhere this year after sucking for decades. On top of that we've seen the Saints show weakness a couple of times this season; they're a lot more up and down than their opponents. So even with the numbers, even knowing that NO has the better running game and might have the better defense, I still wouldn't bet against Indy. Yes, Manning is a machine. That's his weakness. One of Indy's own reporters called him the perfect football computer. I guess he thought that was a compliment. Fact is, machines only work well when there are no unexpected disruptions. Peyton was awesome against some of the lackluster, predictable D's that he faced this season, but he hasn't seen anything like the Saints this year. Remember Tom Brady? This is gonna be fun! Yes, everybody knows the Jets D is predictable. Uh....right. Reading comprehension isn't difficult kids. I refer you to the key word "some" in the sentence you are obviously replying to. I did not say that ALL the D's they played were lackluster and predictable. Consider the Saints D dominated the 2Q holding the "perfect football computer" to 1/2 for 9 yards, completely baffled the Colts with an onside kick to start the 2nd half and picked Manning off on a play that according to one Colt, "has worked for us every time in that situation," I rest my case. The Saints D had a four-stage gameplan and adjusted each stage accordingly as the gmae progressed. End result: Championship. Most teams leave their starting cornerbacks on specific sides of the field rather than moving them around so the better corner is covering the other team's top receiver, and the Bills are no different. The Saints *offense* improves dramatically in the red zone, but that's primarily because of excellent pass defense -- so good that the Saints are first overall in red zone defensive DVOA despite ranking 21st against the run in the red zone. Fixed. I think I was having post-traumatic Jabari Greer flashbacks. Awww, couldn't you have left that one in? 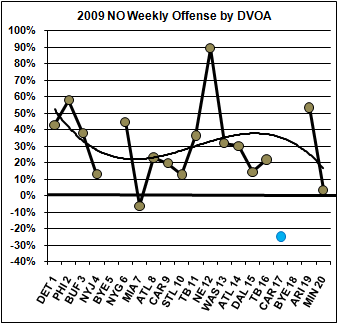 Another wee nitpick: the Saints' defense played against MIN in week 20, not PHI (graphic). "So after Jared Allen takes Peyton Manning down for the 7th time with a 42-7 lead the Vikes finally think that the Super Bowl monkey is off their back......" wake up Dorothy, wake up! Will Allen, make the bad man go away! "and, goddammit, a much better grasp of blitz pickup responsibilities"
Hey, that's Tanier-quality humor. Excellent job. Does it bother you to be so damn funny, but only have a narrow slice of the population get it? Anyway, we appreciate it here. I think they may be sneaking that kind of statement in to see if people are actually reading. OK, I'll bite and admit I don't get the subtle-yet-brilliant joke in these words. There's a video clip with Manning audibly shouting "Goddammit, Donald!" and then running for his life. Donald Brown had missed a blocking assignment. I also like Brown giving a "What'd I do?" gesture during the play. Best ever "what'd I do?" gesture? Kevin Pollack in The Usual Suspects after it turns out he WAS involved in the initial truck hijacking that started the whole thing in motion. Oops. Hilarious reference! BTW, I think Donald Brown was supposed to be looking for a dump-off pass in that situation. As I look at the replay, there was only a 3 man rush. I certainly got a good chuckle out of it. Given what the Saint's wanted to do to Favre and actually did, the blitz pickup from Addai and co will be vital. This may be a key to the game. Saints offence seems to be underestimated by the mainstream press and with Reggie they do have some unpredictabilty, a bit of X factor that you often need in championship games. Bree's and co can stay with the Colts and all the DVOA measures do seem to ask why the lack of love for the Saints. It seems to me that the Colts will probably deliver between 85% to 95% of what we expect of them. Peyton & co will be great and the D will be about average. The unknown is how well the Saints will play. We all know they can be explosive and seem to get turnovers. So they suggest to me that they have a greater variance in performance than the Colts. But unlike other Super Bowls if the Saints are on song they can stay with the Colts and easily win and that starts with Bree's who is a tremendous QB who is playing in an intelligent system with a good and varied supporting cast. So I feel we know what the Colts will deliver - it is up to the Saints to match their impressive DVOA numbers from the season and as we all know about small sample size that is the unknown. Enjoy the game everyone, it should be a good one. Nit: Saints opponent in week 20 was Min, not Phi (NO Weekly Defense chart). Peyton Manning is a center? Of course, great analysis as always. In sentence "They were one of the few teams that averaged more yards per pass without play action (8.2) than with (7.6), but 7.6 yards per carry is nothing to sneeze at," it should say "7.6 yards per pass." Fixed. I'm leaving in the error in the NO defensive chart just to see how many different people mention it without noticing that it has been mentioned already. The over-under is eight. hey, did you hear the one about the week 20 opponent being MIN, not PHI? gets me every time. Another little error: when you say that Colts cornerbacks "allowed fewer yards per carry than any team in the league", I think you mean yards after catch. I don't see this as close game. Since week 13 the Saints have given up an average of 412 yards a game. I just don't see them holding Indy to less than 40pts. As well, NO's offence while good all season has really started to sputter near the end. I see a 14pt plus win and wouldn't at all be suprised by a really big Indy blowout. Every chart has the 0% axis in bold, except the Saints' offense chart, making them appear a little weaker at first glance. 1) Reggie Bush was truly awful returning punts until recently. It certainly seems like he has just now fully recovered from his knee surgery in the offseason. 2) As mentioned above, removing Carney is a boost. 3) After a lousy start to the season, the Saints shuffled their personel on special teams and were fairly good for awhile. Then a wave of injuries hit and special teams starters left the unit to start on defense, leading to another decline. The team is healthier recently. 4) Since the playoffs started, some starters from defense (and maybe offense) have been added to the special teams as the team is going all out for these games. "Why does conventional wisdom -- and the Las Vegas line of Colts by six -- underestimate the Saints? Perhaps it is because the last game each team played is strongest in our minds, and that was the worst offensive game for the Saints since October..."
The last game by the Saints is a big factor in my mind because of two things the Vikings were able to do defensively in the NFC title game. 1. The pass rush took away the deep passing game from the Saints. Can the Colts do that as well? In my mind the game hinges on these two things. The accuracy of Brees and the ability of the Saints to go downfield. Manning and the Colts will be able to dictate match-ups with Wayne, Clark, Addai and Garcon. They'll get their points. I think you are pretty spot on. If Brees plays as poorly as he did last week, the Colts will win easily. They won't do all the dumb things the Vikes did to let the Saints hang around. Thanks for reminding me about SOAP. Probably my only good memory of junior high. I think one aspect that's been overlooked in most commentary I've seen is Manning's relatively high number of interceptions coupled with the Saints defense's high number of interceptions. Manning threw 16 interceptions this season, tied for 7th most in the league, and one in the playoffs (plus another one that was called back because of penalty). His INT rate isn't bad, but it's not great, and because of how much the Colts throw he does throw a high number of picks. According to drive stats, Colts had 28th best INT/drive rate on offense. On the other side Saints D has 3rd most INT/drive, and 3rd most INT total. I could see Saints getting a couple picks on Sunday that will be the difference. Maybe, but his placement against the Jets was phenomenal--when he missed, it was passes to those spots where is receiver could MAYBE reach the ball, but the defender definitely could not. I noticed this particularly on a couple passes toward Revis, kind of a "Reggie, if you can make the play, great, but if not I'm just being safe" throw. A lot of computer models I'm aware of emphasize "recent form" over the full season in most sports. What would DVOA show if only the last 6 games "that mattered" were counted for each team? Is it possible to calculate that conveniently? If not, it's okay. Just wondering. Also think most in Vegas don't see last week as a great defensive game for NO. It grades out as best in DVOA of NO's last six because of the takeaways...but allowing 475 total yards (165 on the ground, 310 in the air) and 58% on third downs is an odd duck for "best defensive game in six weeks." Defensively, New Orleans played four games below 10% (some WAY below)...then played well, rested off a bye week, against Arizona the week after the Cards' marathon shoot out with GB...then allowed 475 yards to Minnesota. The way that hit the eye of Vegas bettors would logically yield Peyton Manning as a favorite in the game I think. Maybe that's worth a field goal, and the historical "favorite inflation" accounts for the rest of the line. Is it possible through the game charts to see if much of Indy's passing is just "extended handoffs," meaning short stuff designed to move the chains (49% on third downs led the league)? I think it's a bit misleading to call them "pass happy." Some have suggested they "can't" run the ball. Given the success of the offense, it looks much more like a choice to move the chains with quick short stuff (that has the potential to break free with YAC). There's the potential here that Indy is on the front end of an evolutionary tick representing a more effective approach, but many are instead seeing a de-emphasized "rushing attack" as a weakness. It's just a different kind of rushing attack. Quick hitter to a guy a few yards downfield where there are fewer tacklers...rather than a handoff to a guy who tries to run through a thick cluster of tacklers at the line of scrimmage. Given Peyton's quick decision-making and accuracy...and Indy's hands...a quick tackle from the defense represents a 3-4 yard gain rather than no gain...allowing the Colts to move past the yard marker (and ultimately the goal line) more often than opponents. Then, a pump fake is a virtual play-action...possibly opening up something deep once everyone's come in to defend the shorter stuff. The 'weighted DVOA' numbers weight recent games higher than older games, with games early in the year not counted at all. Thanks mm. Aware of that. Based on a few clicks back to find the definition, it looks like 7 games ago is still counted at 94% strength, 8 games ago 90% strength, 7 games ago 85% strength, gradually working their way downward. People I respect (I also respect FO of course, OTHER people I respect, lol) have had surprising success just eliminating games entirely from beyond recent form. If we assume the market is most strongly influenced by recent form (hence the correlation between these other people I respect and the market), is it possible that what's happened in the last 6 games with starters for each team helps explain the market price? It may not. Wondering what DVOA would show just for those. That "plus" the fact others may not give the Saints positive credit for last week's game defensively may help explain the difference between an even projection from FO, and the market price. I'm hearing variations in debates of "if Minnesota gained 475 yards but lost on turnovers, what's Indy going to do if they don't have 5 turnovers?" That 475 and the losses to Dallas/TB loom would loom large in something exclusively focused on recent form (meaning zero influence of priors) I think. Seems like it would be at the heart of the difference. Seeing DVOA just for the last six meaningful games for each team might shed light on that. People have discounted NO's blowout of New England because of how the Patriots looked in the playoffs (which happened 7 meaningful games ago)...have penalized them mentally for the loss to Dallas because of how Dallas looked at Minnesota...and have penalized them mentally for what seems like kind of a stolen win vs. the Vikes. Indy doesn't get penalized for resting their starters, then wins 50-20 in the postseason vs. good defenses. Not making the case for a pick for Indy, just trying to see if DVOA over the last six sheds light on the market price. 4th quarter, 2 minute warning. Saints are ahead 35-31. Colts have the ball at their own 5 yard line. Archie and Eli Manning are sitting in the stands wearing their Peyton Manning Colts jerseys, clutching each others hands. Payton Manning begins an epic drive down the field, not too fast, not too slow. The Saints do their best, but it's clear they're winded. Manning moves the ball past midfield. 40 yard line. 30. 20. 10. There are just second left on the clock now, time for one more play. The Saints call their last timeout, desperate for any respite from the Manning onslaught. The refs are huddled on the field and... what's this? Eli Manning is on the field arguing with the refs! What is going on? Peyton Manning is confused, he doesn't know what his brother is doing! And now Archie is on the field! It-it looks like he's trying to calm Peyton down and OH MY GAWD! OH MY GAWD KING! ARCHIE MANNING JUST HIT HIS SON WITH A STEEL CHAIR! PEYTON MANNING IS ON THE GROUND CLUTCHING HIS KNEE AND HIS FATHER IS STANDING OVER HIM! OH MY GAWD, ARCHIE MANNING IS PULLING OFF HIS COLTS JERSEY AND HE'S WEARING A VINTAGE ARCHIE MANNING SAINTS JERSEY! THE CROWD GOES WILD AS PEYTON MANNING LIES SCREAMING ON THE TURF! OH MY GAWD KING, I'VE NEVER SEEN ANYTHING LIKE THIS! WHY, ARCHIE MANNING, WHY? TELL ME WHY YOU SON OF A BIATCH, TELL ME WHYYYYYYYYYYYYYYYYYYYY!!!!! Much agreed. Surely someone with such a pretentious sig quote could do better than some unfunny copypasta. In some ways, this seems like a dull matchup, the two teams are mirror images of each other. Unless Brees really is hurt (as Aikman speculated he was), the on-paper matchup seems to favor the Saints- their defense at its best is significantly better than the Colts', and this is the one game in which the Colts won't have an edge in the passing game. For the first time in many years, the top tier of the NFC was significantly better than the top tier of the AFC, and I expect a 1980s style blowout (although it would be foolish to count Manning out). Your stat about how poorly Indy defends runs to the offensive right side would seem to be (at least partially) an indictment of LDE Robert Mathis' abilities in stopping the run. However, with Freeney doubtful to play Sunday, it's rumored that Indy will move Mathis to the other side (RDE) and play Rahim Brock in Mathis' spot on the left side of the DL. Any ideas as to how this might affect Indy's ability to stop runs that go to the outside with this alignment on their DL? Trivia: Indianapolis and New Orleans are, respectively, the 23rd and 31st biggest TV markets among NFL teams. New Orleans ranks dead last if you accept that, for TV purposes, Green Bay is a satellite of Milwaukee (just as E Rutherford is a satellite of NY). That will make SB44 the smallest-market Superbowl ever. Only GB-KC was even close. Isn't it ironic that in a month's time the CBA expires? It may also explain the (relatively) muted interest in the matchup. Did you actually invoke DVOA-by-quarter as a legitimate statistic? Good god, you guys have leaped so far passed actual analysis it would make Evel Knievel jealous. Saints win the toss in OT? Can we all just agree to let raiderjoe name the teams? I definitely prefer "Siants" and "Cots" to the current terminology. Don't forget the Loins, Veras and "ohter" (49ers). TMQ must be green with envy. Very difficult SB to predict. Having very tough time with this one. Have no money involved so trhowing out pick of Saints winning because rooting for them. One reaosn is make chargers fans jealous when see old qb win Sb and current one not get out of divisional round. but like Saints more than Clots anyway. Saints and cloits similar anyway and think maybe saints get an int and fumble reocovery. very hard to predict turnovers of course. can see game tight and with one qb having to make big drive at end to send game into ot. then saints win in ot. had very good seaosn picking this year but can defintiely get this game wrong. Raiderjoe: drink-sodden dunderhead or brilliant performance artist? You make the call! I'm definitely in the "brilliant performance artist" camp. Of course, there are other categories, such as "guy typing while wearing boxing gloves" that could be proposed. There's a fine line between genius and madness - and it usually involves alcohol. Don't you ever wonder if the music you're playing is too loud? Anyway. Peyton Manning is never going to lose this game. Hope somebody will find some time to post composite DVOA for the last six meaningful games for each team. I know it's a busy weekend...plus some people are dealing with a blizzard. I've eyeballed it off the charts but not sure if I'm doing it right. Went through and totaled up yardage averages for the two teams. Slight schedule strength edge to Indy based on end of season weighted DVOA (average opponent 13th vs. NO's average opponent being 15.5...with Indy playing three teams in the top nine while NO only played two of the top 11). Both teams played four of six at home. Odd to have both Super Bowl teams in negative territory even after throwing out the tank jobs. Neither was particularly devastating in the latter stages of the season (hence their less than stellar weighted DVOA rankings at the end of the season). New Orleans is -53.3 yards per game. They made up for that with a 6-14 edge in turnovers. Indianapolis is -2.4 yards per game. They had a TO edge of 9-12. Factor in tougher schedule...and it would seem the market is giving Indy the benefit of the doubt based on recent form at the expense of the full season...with the notion that turnovers will break about even rather than going dramatically towards the Saints. If the market was assuming TO's would make up for the NO yardage deficit, we'd see a line closer to pick-em I'd think. Didn't realize that NO had allowed more than 400 yards in four of their last six games. Minny's productive game last week was a continuation of that recent trend. Very, very minor nitpick: the Colts played most of their starters a full game against Jax, but it wasn't a "meaningful" game. I don't think the point spread means Vegas thinks the Saints have no chance or is underrating them. It simply means the betting public likes the Colts so the spread needs to widen to draw action to the Saints. The house makes its money on the vig so a 50-50 split in the action is the ideal. Appreciate the comments John and laberge. I've ghostwritten for oddsmakers at various times in the past. 50/50 splits are rare. They generally inflate the line a shade against favorites (public prefers favorites) so the house has the 11/10 AND an extra point or two working for them. Potent combo over a high volume of games. SB line opened at Indy -3 at the very beginning...and the Colts got hit by sharps and squares. Settled where it settled. Don't think "the market" saw this as pick-em and the line's been adjusted 5-6 points for the public. Some public adjustment in the mix. Respected money reportedly on Indy on the moneyline, which wouldn't be true if "the market" saw it as a true pick-em...which would mean emphasizing recent form as best I can tell. 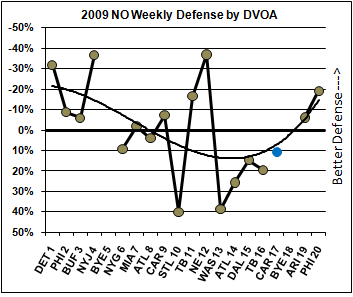 Week 20 of the NO Weekly Defense by DVOA graph says 'PHI'. Should be Minnesota...also, the trend towards better play on week 20 for New O's D is a little suspect: allowing 28 points doesn't 'feel' right, especially since the previous week vs. AZ allowed only 14 and none in the second half--although i am not looking at all the numbers you guys are. did you accidentally plug in Philly's DVOA instead of Minn or something? The "PHI" is just a typo. The Saints gave up yards and points, but they also forced six fumbles and two interceptions. That will do wonders for your DVOA. Got Saints winnign Super Bowl pick correct. "Saints and cloits similar anyway and think maybe saints get an int and fumble reocovery. very hard to predict turnovers of course. can see game tight and with one qb having to make big drive at end to send game into ot. then saints win in ot." They named a team after Yogi? Yogi Berra was a ballplayer long before there were Yogi Bear cartoons.